The problem is, Pero has a secret—he's been working as a clandestine courier for the US State Department for years. If anyone finds out, it may get them all killed. 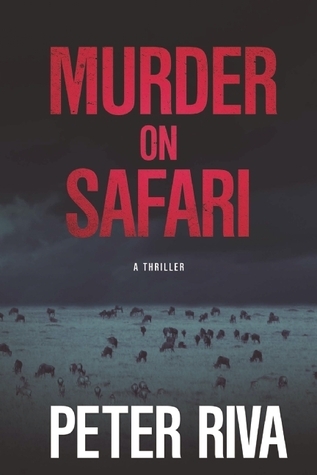 Exciting and expertly plotted, Murder on Safari is a gripping, edge-of-your-seat thriller set in the great wide-open plains of East Africa. Have you ever had an author that you knew you would enjoy every book they ever wrote, no matter how different each book was from the other? I have found that author. Because I absolutely loved Murder on Safari, which is completely different than the previous book that I had read by this author, The Path. It doesn't pertain to this particular book, but I do suggest reading that one as well. It was such a great book, and completely took me by surprise at how much I was completely enamored by that book! But we are here for Murder on Safari, so without further ado, here are my thoughts. This book started off at full speed. I have been known to read a book or two that kind of just jumped into the "deep end" so to speak, and wasn't able to pull it off. But Mr. Peter Riva was able to do so masterfully. I was worried that with the action happening so early on, I wouldn't be connected to the characters that it was happening to. But I was wrong. It was like an instant switch was flipped when I started reading this book with the characters. I loved them all, and thought they were all well written and well-rounded characters. Even the ones that didn't get much playing time in the book, I still could remember them and distinctly point them out in my head as I was reading the book. With that said, I had a particular attachment to Mbuno. I don't know why, and am not particularly sure if Riva wrote him that way on purpose or if it's just me. I thought he was an interesting character to get to know, as well as watch things unfold around. He was meant to be a main character, that is for sure. But I am certain most people will connect with Pero more, but not me. And I am excited to know that there is another story containing Mbuno, so I will be picking that up very, very soon. I didn't read much of what it was about, because quite frankly Peter Riva is now an auto-need all his books author. But I do think it has to do with some story that is kind of eluded to in this book, so I am looking forward to learning more about that, hopefully. But whatever it is about, I'm sure it will be great, because it has my favorite safari guide in it! The action in this book was spot on. I am not one to usually be driven by a lot of action, as I can read slower books and still enjoy them equally as much. But I have to admit, that I was forced to sit up a little straighter while reading bits of this book. I guess the phrase "at the edge of your seat" would pertain quite accurately to this book. I felt that it was paced just right to keep you needing to read more. It started off almost immediately with one Pero's crew me members being murdered, and that isn't really a spoiler as it's on the back of the book. This kind of explains my earlier statement of how it kind of just jumps into the plot straight off, because this happens day one of the filming. And once that happens, it's kind of all downhill from there, with a lot of stuff happening all over the place. I will briefly touch on the setting of this book, as many people before me have better written about it. I loved that this book took place in areas of Africa that I have never read about. And Peter Riva was able to capture the setting of each new place just so that I was able to picture them perfectly in my mind, with little to no knowledge of most of the places. The setting came to life, and that is hard to do for a reader that hasn't experienced any of those places much, even in school. All in all, this book was great. I feel that if you are a reader of thrillers, you will get great enjoyment out of this book, with added bonuses all throughout with the descriptions of the animals and places, and the added filming aspect (which I thought was a great bonus to this plot of this story, and extremely interesting to read about...even though I am just now touching on it). And if you aren't a reader of thrillers, but just like really well written books with awesome characters and a drivable plot line...this is also the book for you. So glad I was able to be a part of this tour, as I had received an email about the sequel and wanted to join, but hadn't read this one yet. So, thank you Mr. Riva for sending me this book and the sequel for review, I look forward to picking up your next book and all the future ones you write!